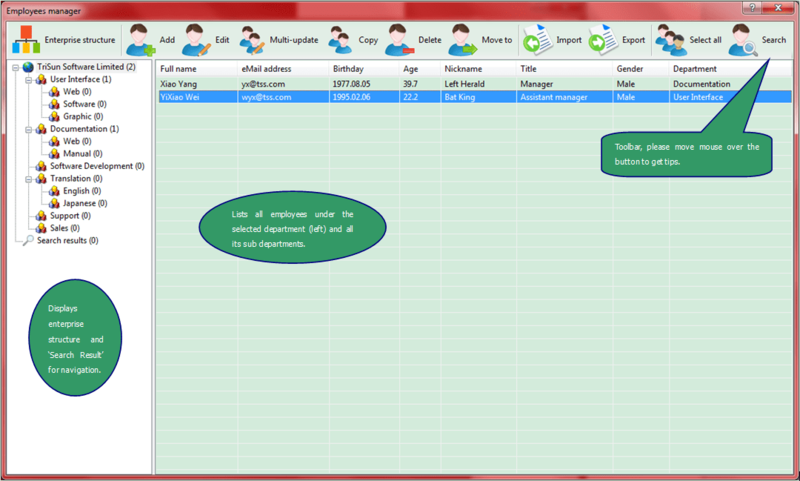 Click 'Persons -> Employees manager' module link on the main interface. <Enterprise structure> - manages your enterprise structure on the Enterprise structure interface. <Add> - adds a new employee on the Employee editor interface <Ctrl+N>. <Edit> - edits the selected employee on the Employee editor interface <Ctrl+E or double-click>. <Copy> - duplicates the selected employee <Ctrl+C>. <Delete> - deletes the selected employee(s) <Del>. <Move to> - moves the selected employee(s) to other department <Ctrl+M>. <Import> - imports employees from the specified file <Ctrl+I>. <Export> - exports all employees to a file for backing up <Ctrl+O>. <Select all> - selects all employees in current list <Ctrl+A>. <Search> - finds employees according to the specified conditions on the Search employees interface <F3>.